Corporate Governance | GENDAI AGENCY Inc. The Company's management considers sustained growth in shareholder value to be its most important responsibility and has a code of conduct that calls for the practice of corporate activities constantly focused on the interest of shareholders while ensuring management soundness (compliance) and transparency (disclosure). The Company decides matters prescribed in laws and regulations and the Articles of Incorporation and important matters of company management prescribed in the Board of Directors Regulations at meetings of the Board of Directors held at least once a month. Since the Company has a small number of full-time directors, routine, frequent communication is possible, and the Company believes the management system makes possible checks and effective oversight of business execution by means of the election of outside directors. The Company has introduced an executive officer system for the purpose of segregating decision making and management oversight from business execution and clearly defining responsibilities. The Board of Executive Officers, consisting of executive officers elected by the Board of Directors, engages in rigorous deliberations and realizes agile business execution. 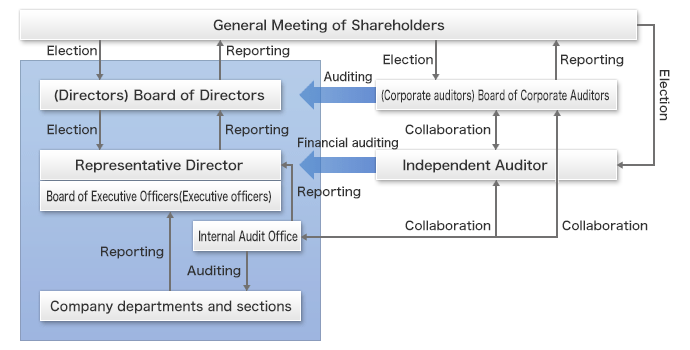 The corporate auditors regularly attend meetings of the Board of Directors, actively participate in meetings of the Board of Executive Officers and other important internal meetings, and focus on conducting audits to detect violations of the law or the Articles of Incorporation or matters that infringe the interest of shareholders. The Board of Corporate Auditors meets periodically to discuss important matters concerning auditing.